After careful consideration and scientific research, I present The Official Countdown of the Eight Worst Moments in Ashes History*. Five of which are not, technically, moments. There were four Ashes Tests in 1888 - one in Australia, three in England - and Australia managed a total of 631 runs for 80 wickets in them. In eight innings they reached three figures twice, and topped 120 on a grand total of zero occasions. On six of those, they were skittled out for 82 or fewer. Admittedly, those were very different times for batting, but England averaged almost twice as many runs per wicket. 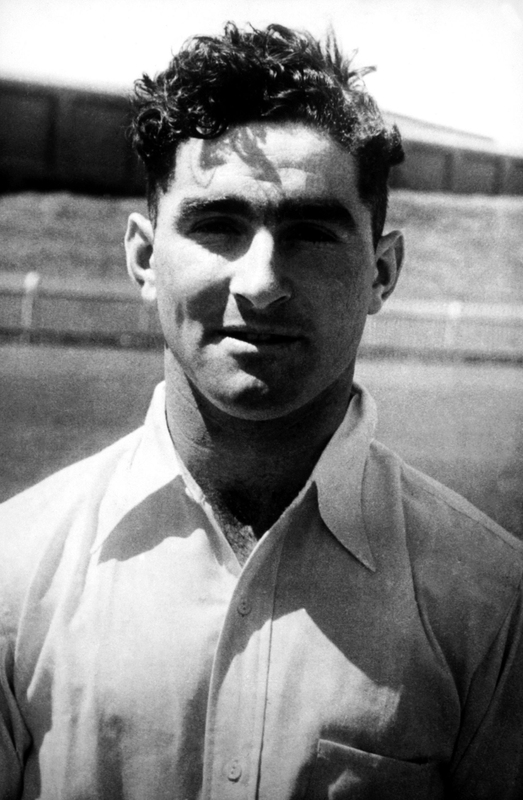 Australia's highest individual score was 32, and their top run scorers in the four games were Percy McDonnell and Charlie Turner, who both managed a sub-Bradmanic 79 runs in eight innings. If Glenn McGrath had played in that team, he would have found himself batting at No. 4. Enough said. The details of the last Ashes series in Australia have, it is fair to say, been well documented. As well as badly documented. It was the perfect storm of cricketing catastrophe. A rare era of English selectorial steadiness and on-field success collapsed into an indigestible chimichanga of recrimination, retirement and Mitch-induced befuddlement in the face of the greatest sustained display of pace bowling this millennium. 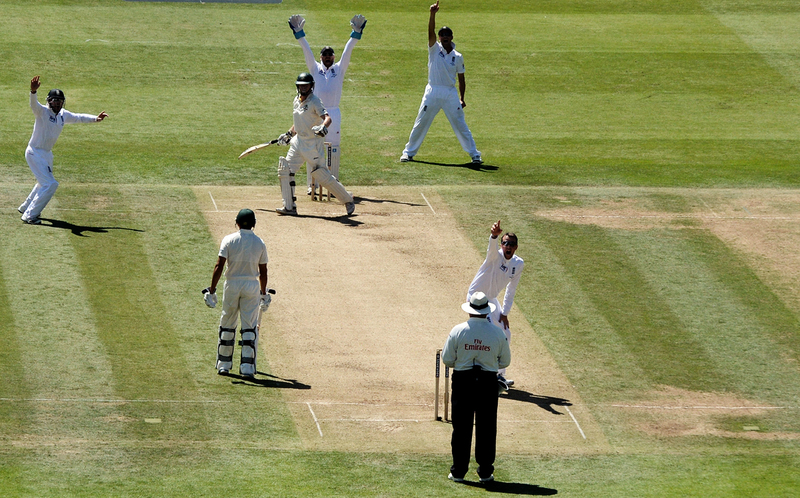 As things currently stand, eight players played their final Test for England in the series - Chris Tremlett, Graeme Swann, Tim Bresnan, Monty Panesar, Kevin Pietersen, Michael Carberry, Boyd Rankin and Scott Borthwick, the last four in the final Test, one of only two occasions since 1952 that four players have played their final Test for England in the same game. It is only the second time since 1939 that eight or more England players have departed the Test arena in the same series, although it fell one short of the selectorially surreal 1989 Ashes (see below). Moreover, Matt Prior and Jonathan Trott were almost finished at international cricketers, and Ian Bell was fading after his heroic 2013 summer. For the first time, England returned from a five-Test Ashes series in Australia without a single batsman with 300 runs in the scorebook (a document that, I am reliably informed, is now kept in a secure vault 200 miles beneath Lord's, to prevent any impressionable young English batsmen seeing it and getting irreparably scarred). By the end of the series, England gave the impression that, had a bonus sixth Test been hastily scheduled against a team of platypuses from a local zoo, Cook and his team would have found themselves 75 for 7 at lunch on the first day, asking each other: "Who's that guy who batted at six? Wasn't he that gap-year student we saw sleeping off a hangover on a bench outside the ground just before the start of play?" Overall, England offered the world a haunting human drama exploring the fragile, illusory nature of stable cohesion, and how rapidly the strands of success can unravel. In essence, it can now be viewed as the liberal world's first warning that Donald Trump would be elected. England's drought-breaking 2005 victory, in a series of dramatic perfection, is widely acknowledged by all sensible people as the high point of human civilisation. It was laced with such tension and brilliance, toppling one of the greatest cricketing dynasties ever to have played the game, that many suspected it was the result of a secret Faustian ECB pact with the devil (in the days before they would invite such colleagues to land helicopters full of pretend money at Lord's). The truth of the largely undocumented Mephistophelean truth behind the 2005 miracle was laid painfully bare within 0.0 overs of the start of the 2006-07 series, when Steve Harmison, recently the world's leading paceman, redefined the parameters of physics. As Andrew Flintoff nonchalantly fielded the ball at second slip, a profound philosophical question arose: can a team lose a series 5-0 before bowling a single legitimate delivery? The 1938 Ashes saw an all-time Test record five double-centuries scored, by five different players (not including Bradman, who had to content himself with three regular centuries instead). Ten players scored a total of 14 centuries (both records for an Ashes series in England), despite the series being reduced to four Tests after Old Trafford was rained off. Len Hutton made 364 at The Oval. Clayvel Lindsay Badcock (known as Jack, for understandable reasons) spurned such run-making fripperies and focused all his attention on compiling the worst ever Ashes series by a top-order batsman. Or indeed, a middle-order batsman. He was a prodigious first-class batsman, who ended his career with an average of 54, and 25 centuries, in 90 non-Test matches, and had taken a hundred off England in 1936-37. But with the shadow of war looming over the world, Badcock gave himself ample time for dressing-room reflection on the state of humanity, and the wondrous weirdness of his own full name, by amassing just 32 runs in eight innings, at an average of 4.57, with a highest score of 9 and a three-ball pair at Lord's. Collectively, both sides' batsmen averaged 39.17, the second highest figure for an Ashes series, behind 1965-66 (see below) at 39.79. Had it not been for Badcock, 1938 would hold that record. Comfortably. In 1946-47, England travelled to Australia for the first post-War Ashes, to face an ageing Bradman, recovering from illness and injury, contemplating retirement, more than eight years since he had limped out of the previous Test between the two nations. 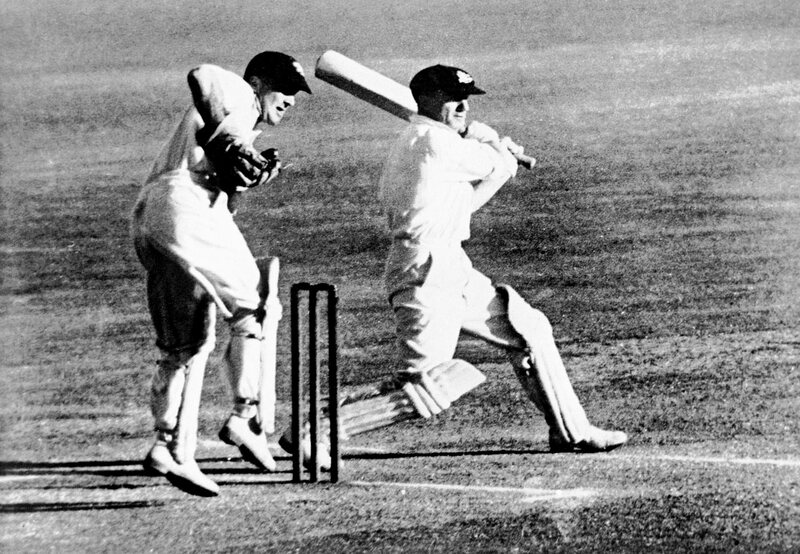 In the first Test, Bradman scratched his way to 28, before edging a Bill Voce delivery into the safe hands of Jack Ikin (31 catches in 18 previous Tests). According to no less a source than ESPNcricinfo , England were so sure of the obvious legitimacy of the catch that they barely appealed. Bradman always claimed he was sure it was a bump ball. Or perhaps he was getting in a pre-emptive revenge for the 2013 Stuart Broad incident. Unlike that famous moment of non-walkery, Bradman's non-dismissal could not be analysed by multiple camera angles and slow-motion replays. Instead, only the opinions of opponents, commentators, spectators, journalists, and team-mates suggested that he was out. Bradman, and crucially the veteran umpire George Borwick, disagreed. Australia had lost two early wickets, Bradman's departure would have left them three down for 74, just before lunch. Instead, he ended the day on 162, and was finally out for 187 with the score at 322 for 3. Australia racked up 645, England were skittled out twice to lose by an innings and 332, and Australia went on to win ten and draw three of the next 13 Ashes Tests. Had Bradman been given out, a confidence-infused England would UNQUESTIONABLY have blasted through the rest of the Australian batting line-up like a chainsaw through a Barbie doll (citation needed). Seven debutants awaited (six of whom discovered subsequently that they had in fact already made their Test debut, in a match against New Zealand earlier in 1946, whose status was only Testified in 1948). My special cricket re-enactment software suggests that had Borwick's finger been raised, Australia would have been bowled out for 134. Unstoppably rampant, England would then have annihilated the callow baggy-green bowling attack spearheaded by the now tension-jellified Ray Lindwall, Keith Miller and Ernie Toshack (681 for 5 declared in 102.3 overs), before Alec Bedser, bowling left-handed to make a game of it, would have taken 8 for 13 to dismiss Australia for 41. Bradman would have announce his retirement en route to the crease, and then, obviously, he would have made a duck, as he did in 100% of his last ever Test innings. His Test average would thus have plummeted to a basically useless and distinctly un-iconic 94.83. England would have romped rompishly to a series whitewash, launching a period of unbroken Ashes dominance lasting until at least 2027, the joy of which would have turned the entire United Kingdom into the happiest and most productive nation on earth. Mike Atherton would have averaged 500 at a strike rate of 97 in his personal head-to-head with Glenn McGrath. Shane Warne would have given up cricket at the age of two and become an Olympic ski-jumping champion instead. The Cold War would have been settled over tea and biscuits in 1949. All known diseases would have been cured. Brexit and Trump would never have even come close to happening. The world would be living in peace, prosperity and harmony. Come on, Borwick, it was clearly out. I could see that from here - 10,000 miles and 71 years away. While much of world was enjoying the social liberalisations and creative outpourings of the 1960s, Ashes cricket was conducted as if trying to slow the rotation of the planet and institute some form of excitement-rationing scheme to prevent everyone else charging off to San Francisco with flowers in their hair. Three of the series were drawn, the other won by a one-Test margin, yet only two of the four reached an urn-deciding fifth Test. The 1965-66 decider was a slow-acting run glut in which England would have needed an extra three or four weeks to force a result, and in the second innings of the final Test of 1962-63, England, with time running out and needing victory to regain the urn, pottered along with the urgency of a cucumber to 268 for 8 declared, at 2.4 per over, before Australia comfortably stodged out for a draw. The Old Trafford Test of 1964 will stand eternally as one of the great temples to pointless run-harvesting. Australia's 656 for 8 off 255 overs was surpassed in time-sapping duration by England's 611 all out in 293. They constituted the longest combined first innings in Test history, by a margin of more than 60 overs (with only two more matches within 100 overs). There was an almost complete lack of dramatic denouements - in 1965-66, in five Tests, a grand total of 16 balls were delivered in the fourth innings of matches (and there were only 66.2 fourth-innings overs in the entire 1964 series). The Ashes 1960s ended in a thrilling flurry of clock-defying Derek Underwood wickets at a rain-sloshed Oval, but let that not un-detract from the most remorselessly tedious period in Ashes history. England's 4-0 defeat in 1989 was possibly the most flattering result in their history. They escaped with two rain-aided draws, and were clouted in the other matches. Even a 6-0 whitewash would have seemed harsh on Allan Border's Australians. It is what happened in the selection meetings, however, that will surely stand eternal in the annals of our species as being among the most incomprehensible series of human conversations ever conducted. The selectorial scattergun strafed the county averages with eye-watering lunacy. They picked a total of 29 players, made four changes after each of the first four Tests, and six changes after the fifth, repeatedly barking up the wrong trees and at the wrong cats. There were baffling recalls, baffling debuts, and remarkably, baffling omissions. A new rebel tour to South Africa was announced amid the carnage, and, having begun the summer as slight favourites after five Ashes wins in the previous six series, England ended it having recorded just one home Test win in four years, looking like a pterodactyl that had just attempted to fly through a jet engine. Chris Rogers was a very good, very experienced batsman. Graeme Swann was a very good, very experienced bowler. Marais Erasmus was a very good, very experienced umpire. Together, they combined for the worst single ball in Ashes history. Possibly the worst single ball ever played out in 140 years of Test cricket. 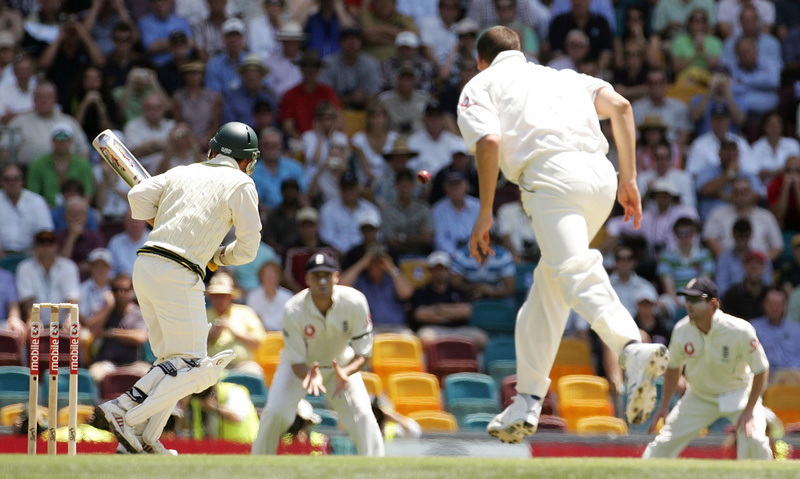 Swann, a 200-wicket Test veteran and master of his craft, looped up a repulsive gut-high full toss. Rogers, with almost 20,000 first-class runs at an average of 50 lodged in his personal well of batting memory, essayed a hoicking thwack that deserved at best an official government censure and at worst a jail term. His obviously horrified bat flailed across the line, one hand coming off the handle as if in instinctive preparation for an apology to all 28,000 people at Lord's and the millions watching on television. The confused, traumatised ball hit Rogers in the abdomen. England appealed. Erasmus (ten years a first-class umpire) raised the finger - presumably on grounds of artistic impression, or the sense that someone, anyone, needed to be punished for what had just been perpetrated at the Home of Cricket. Rogers could have reviewed the decision, but he evidently could not bear to force the TV umpire to watch a replay of what he had just done, and trudged off. The ball-tracking technology showed that the ball, by now blushing a dark crimson shade of embarrassment, would have comfortably missed the stumps. All dogs within a 30-mile radius of Lord's spontaneously howled. Koalas fell out of trees. Every single baby in both England and Australia burst into tears. The kangaroos in nearby London Zoo tried to climb into their own pouches. No one would ever be able to fully understand or explain what had just happened. *I reduced a longlist of thousands down to these eight with a ruthless lack of objectivity and an immovable willingness to overlook other more deserving candidates (including Nasser Hussain mixing up the words "have a bat" and "have a bowl" after winning the toss in Brisbane in 2002-03; England's slow-motion four-hour car crash on the final day in Adelaide in 2006-07; Australia's batting against spin in 1956; Australia's batting at the MCG in 2010-11; England's seamers collectively returning a strike rate of a wicket every 24.3 overs (and an average of 79) in the first five Tests of 1993; and England putting all their fielders on the boundary at The Oval in 2013 when they were 3-0 up in the series and RYAN HARRIS WAS BATTING).